First, a bit of history: “Iris folding is a paper craft technique that involves folding strips of colored paper in such a way to form a design. The center of the design forms an iris — a shape reminiscent of the iris diaphragm of a camera lens. Iris folding originated in Holland, where early craft persons made their designs using patterned paper cut from the inside of envelopes. Today, crafters use any light weight paper, such as scrapbook paper, origami paper, wrapping paper, the inside of envelopes or pages of magazines. Ribbon is also used. Iris folding is done with a pattern. 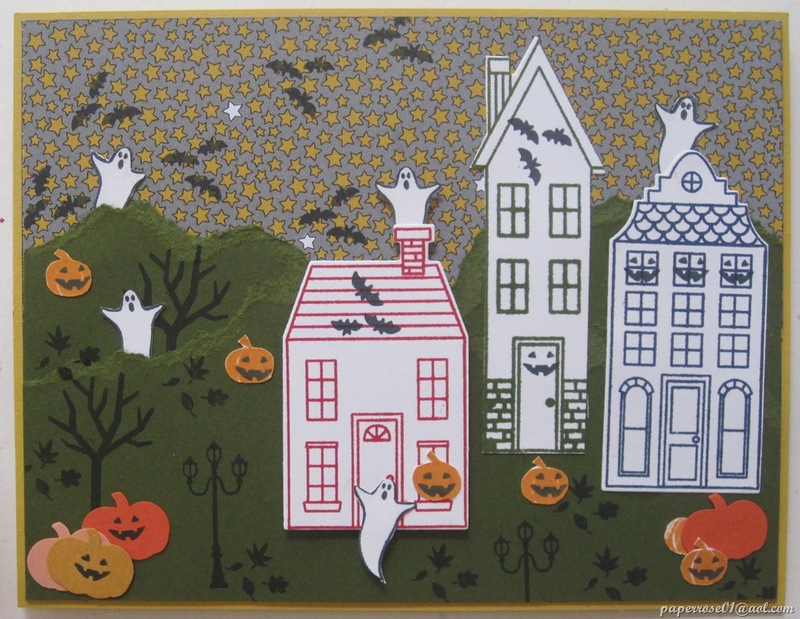 The crafter uses the finished product to decorate the front of a greeting card, as a scrapbook embellishment, to decorate an altered book or a mixed media collage, or in various other ways. Supplies for iris folding include a pattern, strips of colored paper, permanent transparent tape, cutting tools and a temporary tape such as painters tape. The temporary tape is used to hold the pattern in place while the craft person creates the design. For our introduction to Iris Folding, I have chosen two easy seasonal patterns – fall leaves and Christmas stockings hung on the mantel. Each cutout comes with a pattern. We will tape our pattern face down on the pattern and simply tape our Iris Folding Material to the cutout. That’s all it is – cut your material and tape in place, repeat, repeat and repeat. You just need 1 or 2 good eyes and patience to stick with the pattern. 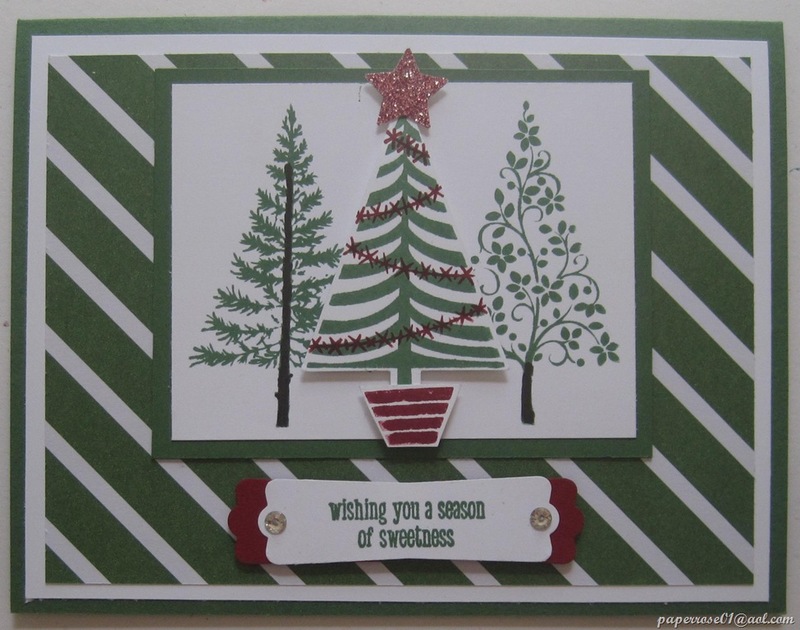 I will be providing your cutout, pattern, and all the materials needed to make a card just like the one sbelow. If you are skilled with craft knife cutting, you can make your own cutout. in the future I, however, prefer purchasing them pre-cut and with the pattern. 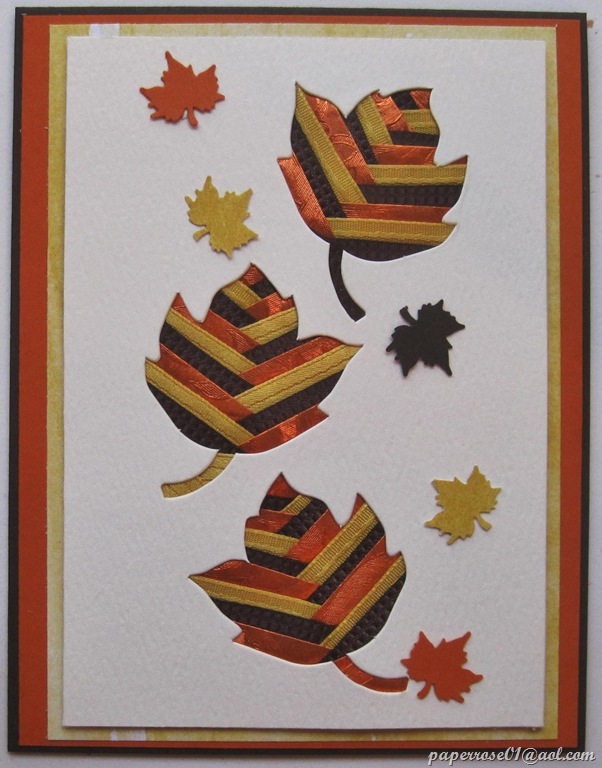 This first card is entitled Falling Leaves. However, I always forget the leaves are falling and leave them upright. I can pretend they are flying through the air on a soft autumn breeze! 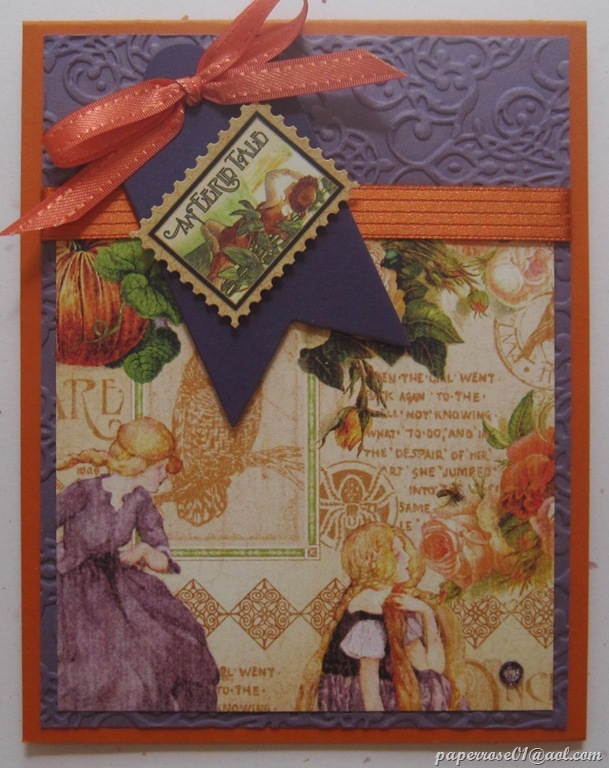 I used Hello Honey and Early Espresso ribbon from Stampin’ Up, and an orange foil as my Iris Folding materials. You can make the leaves different, or the same as I did. I punched tiny card stock leaves to coordinate with the Iris Folding and mounted the card on Hello Honey variegated DSP, Early Espresso, and Pumpkin Pie. The second card is titled 3 Christmas Stockings and hang from a 4” mantle. I used brown mulberry paper for the mantle, a red raffia ribbon for the top of the stockings, silver and gold washi foil, red cotton ribbon, and a green pattern washi paper. The washi papers are very thin, pliable and easy to work with. I picked up some gold holiday greetings at Memories and Beyond in Downers Grove. Note the tiny gold stars which were punched from the extra gold foil on the greetings sheet. A thin gold band also embellishes the top of the Garden Green card. Real Red card stock and ribbon add to the layered card. I took a fine Micron pen and drew my stocking holder and bow up to the mantle top. These cards are beautiful and are easy to make. Ask Judy or Wanda – they will tell you how much fun it is to make these. The dates for the Iris Folding classes I am offering are Friday October 17th from 3 – 5 PM and 7 – 9 PM, and Saturday October 18th from 10 AM – 12 N and 1 – 3 PM. As I will need to demonstrate and give verbal instructions, I am giving specific times. I do need a firm commitment for this fun class and will have a sign-up sheet available at the upcoming stamp camp. 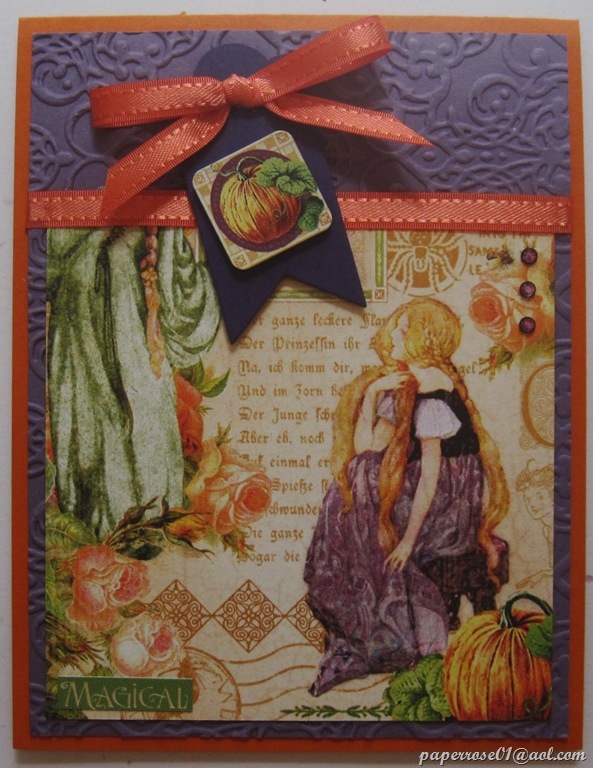 What will you choose – the Christmas or the Halloween easel card? It’s your choice at our September stamp camp. I love easel cards and was dismayed to find the Paperroses crafters had not made one of these creative cards since 2011. I must admit my brain was not in full gear when I went searching for my directions. First of all, I could not think of the word easel for the life of me – a senior moment? So I kept searching for a pop-up card. I looked in the SU demonstrator’s website and in Scrapbook Stampers, but no such luck. Finally, I pulled up my stamp camp directions for the past several years and lo and behold – there it was! 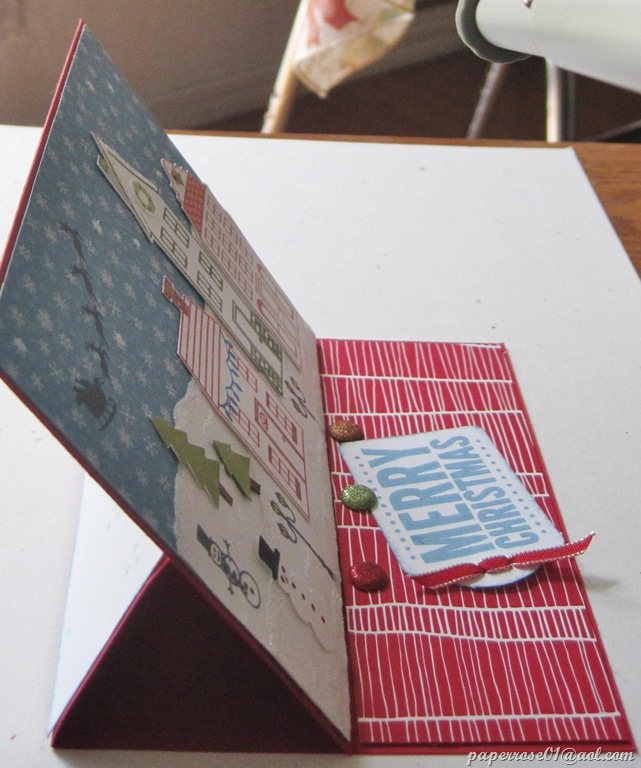 Here’s the view of our Christmas easel card when it is closed. The view above is the card when it is opened. I used the “Holiday Home” stamp set (only $15.95)and the Homemade Holiday Framelits (bundle price $31.95) for this wintery scene. 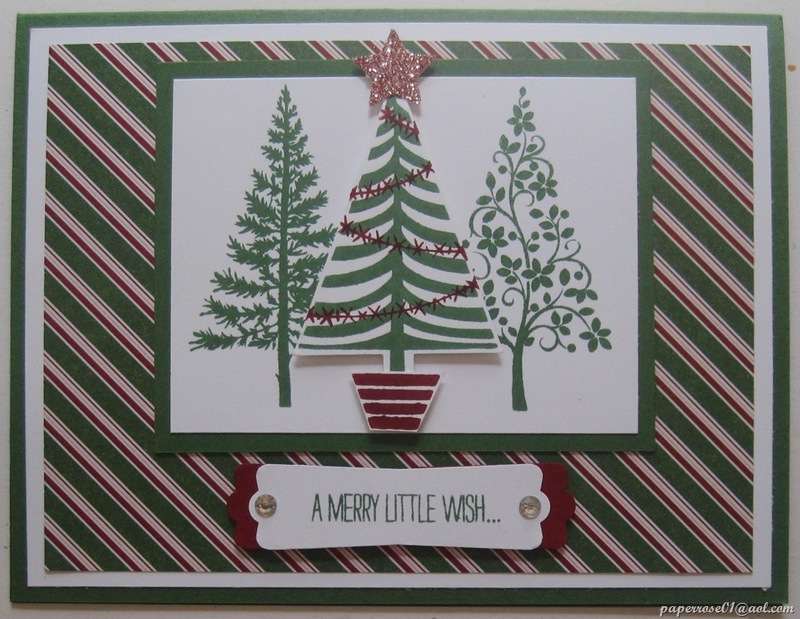 This type of card is very easy – we create the front and adhere it to the easel portion of the card. However, when it came time for me to put my first Christmas easel together, I became totally confused – a second senior moment? FINALLY, I gathered my senses and proceeded to finish the card construction! 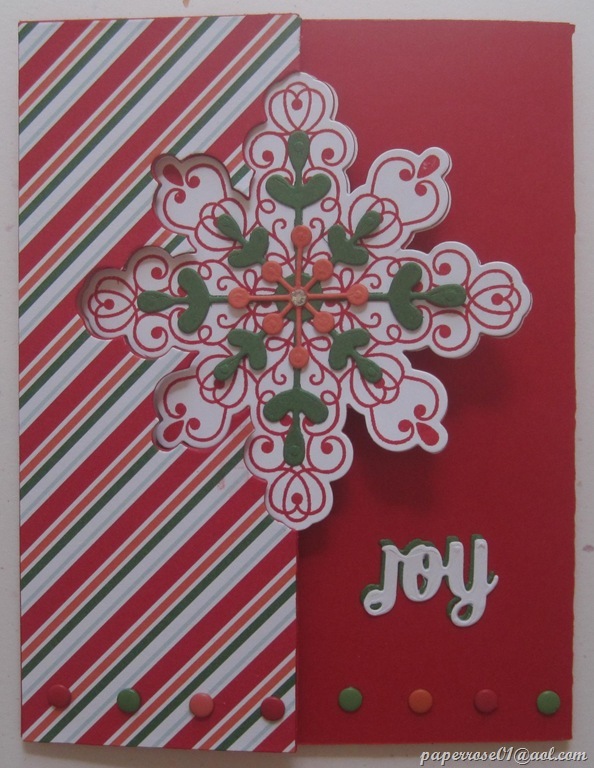 This is a side view of the Christmas easel card. You can see how the card front layer “rests” on the easel portion. The red front portion of the card stops the front card layer from sliding forward. Three glimmer brads act as the “stops” for the card. A holiday greeting from the new “Merry Everything” stamp set and “Note Tag Punch” bundle, embellishes the front portion of the card. However, I wanted to add a place for a more personal message. A few snowflakes, and the message “from our house to yours at Christmas time” stamped in Marina Mist on Whisper White card stock provided just what I was looking for. The back of the easel panel is blank so this is the perfect place to add a personal message, as shown here. BUT, what if you are not in the mood for Christmas with snow, pine trees, holiday lights, and snowmen? 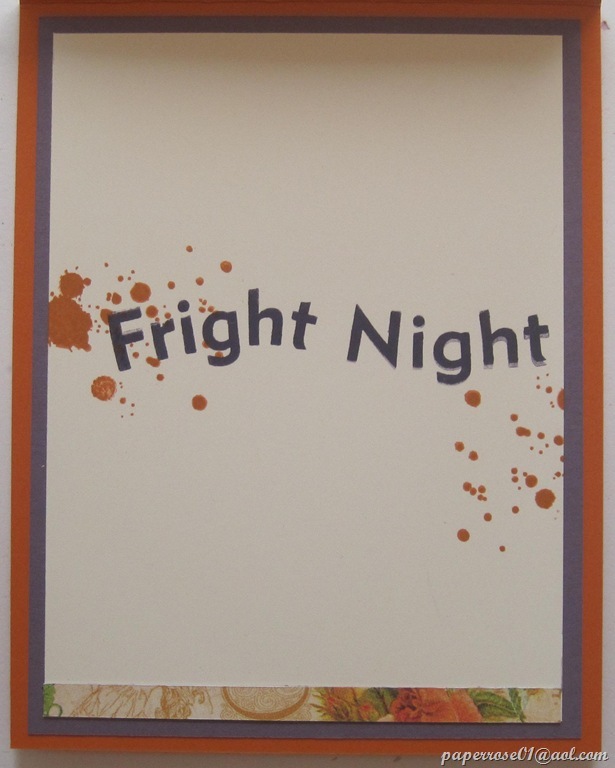 Then the Halloween easel card will be just right for you! Using the “Holiday Home” stamp set bundle again, the color scheme was changed from Real Red and Marina Mist, to Hello Honey and Mossy Meadow. Ghosts and bats magically appear, as do pumpkins and black leaves falling from the bare trees. 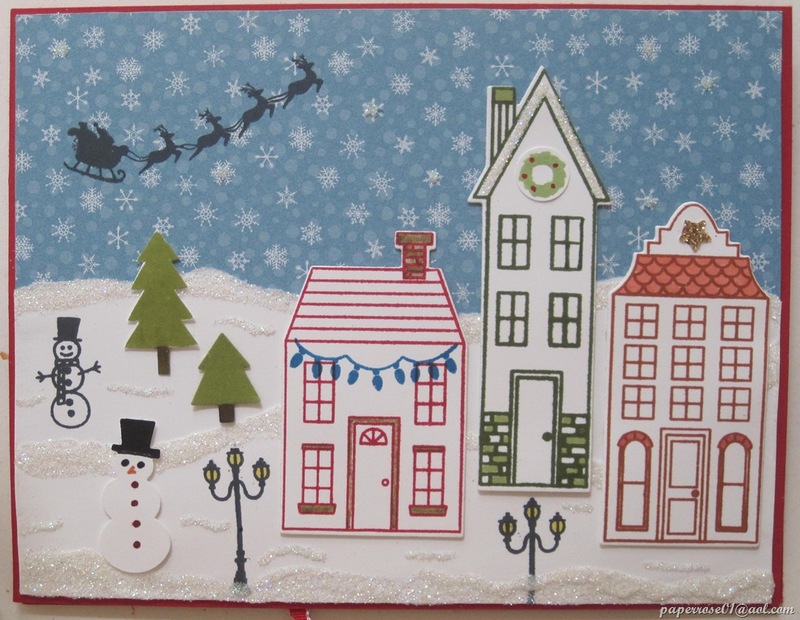 As shown in the Christmas view, the front portion of the card acts as a “stop” to the front card layer. Three glimmer brads were again used as the “stop” mechanisms. 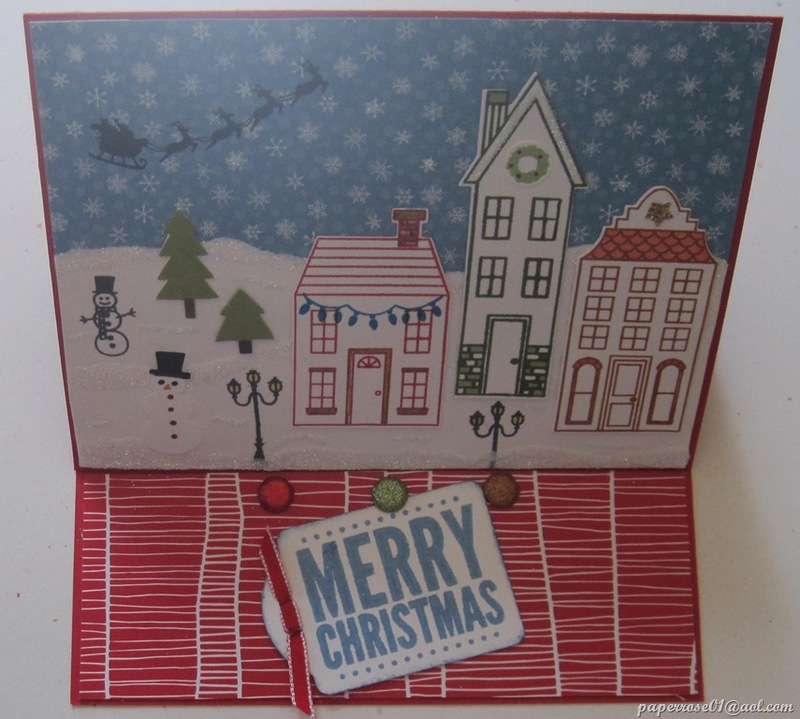 The “Merry Everything” stamp set and “Note Tag Punch” bundle were used again to embellish the card front. The closed view of the card shows the embellishments best. I love the faces on the little pumpkins. The “Holiday Home” stamp set has the additional stamps that make this card so interesting and the set is a bargain for $15.95. Although it is nice to have the framelits for the houses, the houses are quite easy to cut by hand. 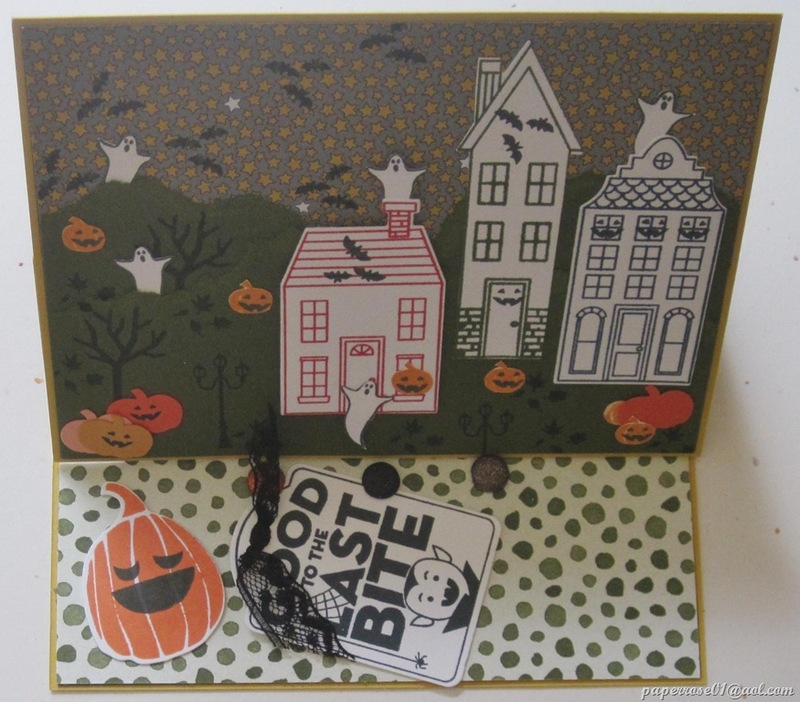 I did use a “big box” punch for some of the pumpkins, but used the pumpkin face from the “Holiday Home” stamp set. The blank back of the easel is again used to add a personal message. “Happy Halloween” and a few black bats convey what I want to say. We are certainly not going to wait another three years before we do another easel card. These are fun to make, and are a “wow” surprise for the lucky person who receives one! If you know which card you would like to male, and can let me know ahead of time, I will pre-cut some pine trees and punch the snowman – or pre-cut some ghosts and pumpkins. Having these mechanical tasks pre-done will save you a few minutes of time. Iris Folding – two cards (one Christmas, one fall) on Friday October 17th from 3 – 5 PM and 7 – 9 PM; Saturday October 18th from 10 AM – 12 N and 1 – 3 PM. As I will need to demonstrate and give verbal instructions, I am giving specific times. The cost will be $9 and will include all materials and supplies. I will require a firm commitment for this class as I have certain supplies that must be purchased. Iris Folding is beautiful and so easy! You just need one or two good eyes and patience! 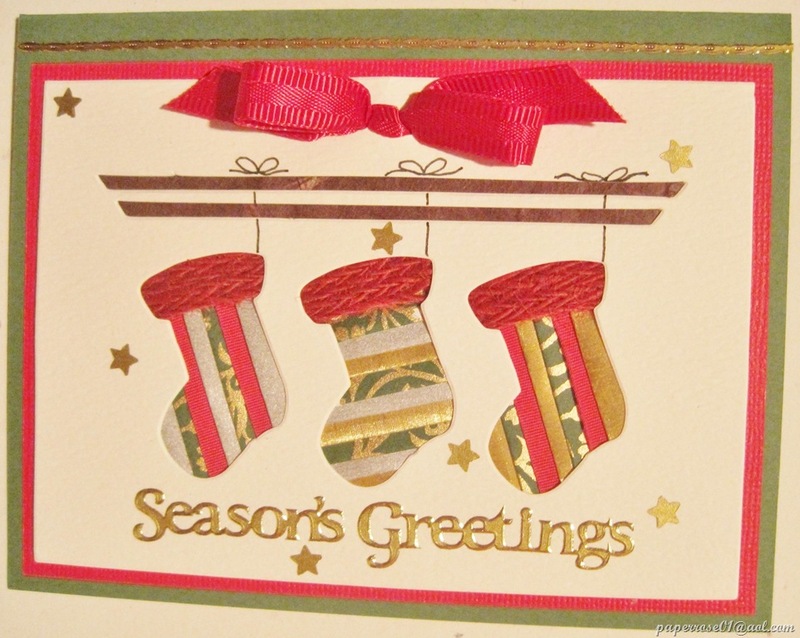 Stamp-A-Stack – 3 or 4 (your choice) each of 5 different Christmas cards (total of 15 or 20 cards.) Thursday November 13th and Friday November 14th from 2 – 9 PM and Saturday November 15th from 9 AM to 4 PM. These cards will be totally different from cards done at Stamp Camp and will use different stamp sets. Samples will be posted. I made several sizes and used several thicknesses of paper: Stampin’ Up DSP, Big Box Store DSP, Core’dinations, and regular SU card stock. Instructions that come with the Gift Box Punch Board ($19.95) are very user friendly (even I can understand them). A suggestion is made to adhere the folds inside or outside the box in order to increase the strength of the box; I tried both ways. 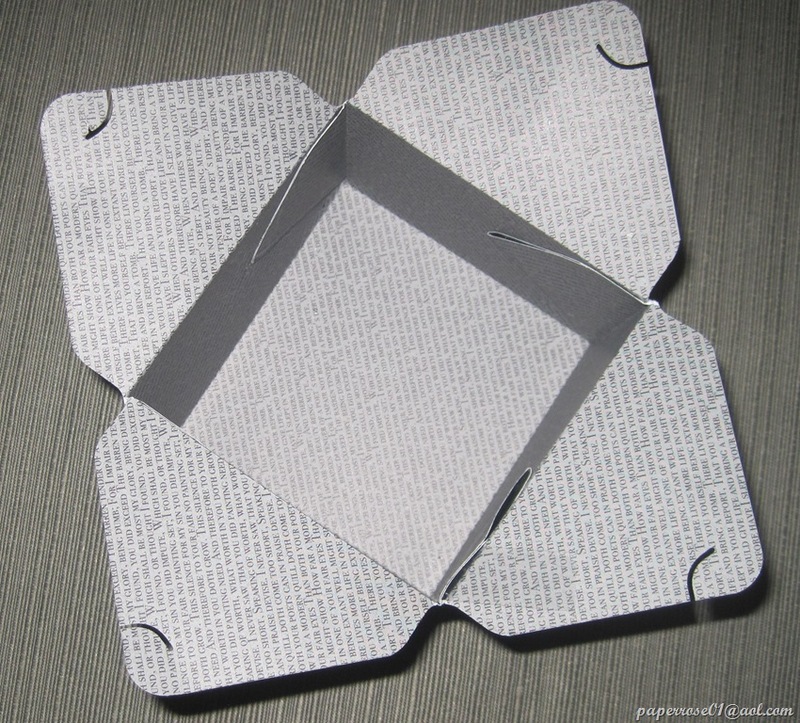 One thing is definite – the bigger boxes do best with heavier card stock. There is no need to make a separate lid as these boxes have self closure. This picture is of an open box. You can faintly see the folds adhered inside the box. Note the thin curved cut on each flap. By joining the curved cuts on opposite sides, the box closes. This particular box was made from black and gray SU DSP. The DSP cracked at some of the score lines, and the white inner core peeked through. Care must be given when choosing cs for these boxes. 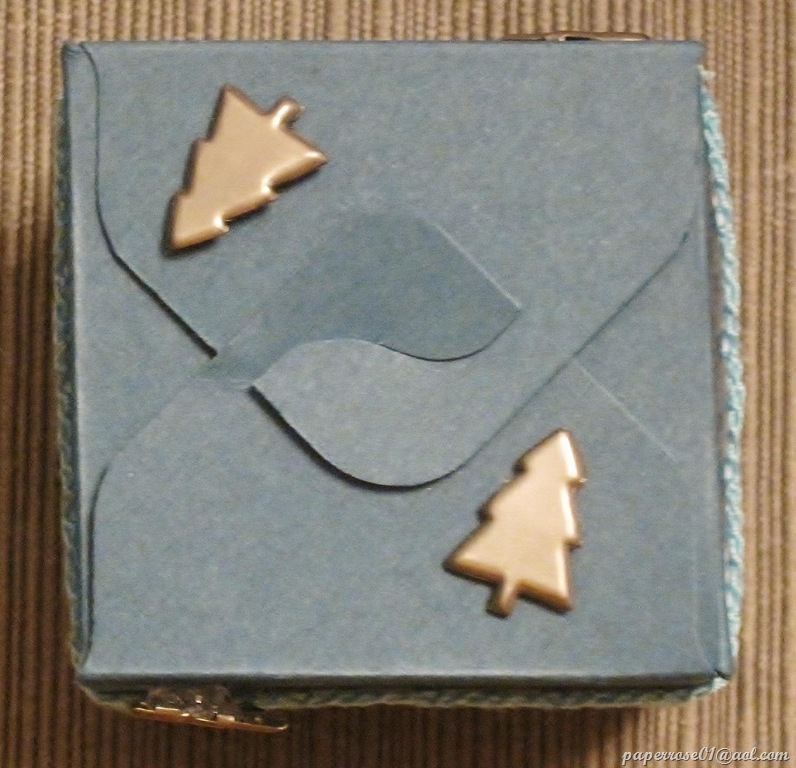 Here you can see a close-up of a small closed box. See how the flaps join and close the box. Pretty cool! For the September Stamp Camp, you can choose the size box you want as well as the card stock you wish to use. I will work with you as you score, fold, and close. You can embellish your box as you wish. The decorations I used were simple – silver tree brads, punched bats, felt flowers, punched DSP, and lots of ribbon. As I mentioned in yesterday’s blog, the Gift Box Punch Board amazes me. 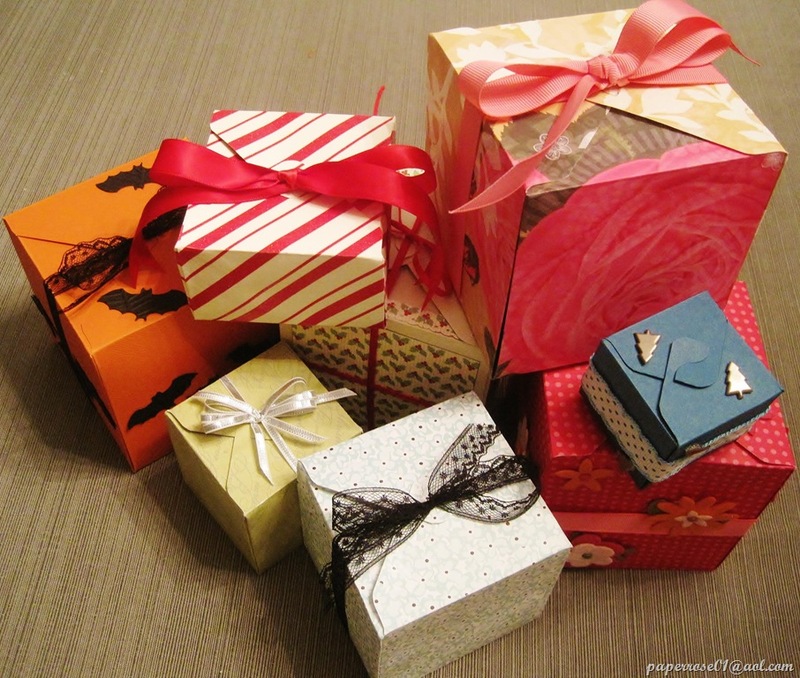 – this is such a simple solution for a small gift – a few cookies, a bag of candy, small Bath and Body products, lip gloss, jewelry, etc. This box is perfect for the mailman, Secret Santa, friends, foes and family. I hope to see you at the September Stamp camp – Thursday and Friday (Sept. 4th and 5th) from 2 – 9 PM, and Saturday (Sept. 6th) from 9 AM to 4 PM. Come when it is convenient for you. $12 is the cost for all the supplies and tools. Give me a call if you need a different date or time. I am very flexible. Many thanks to those of you who have already let me know when you will be attending. Hubby and I went over our calendar last night, and determined the dates/times for the two special workshops I will be offering this fall. I don’t have a cost yet, but will try to keep the price as inexpensive as possible. 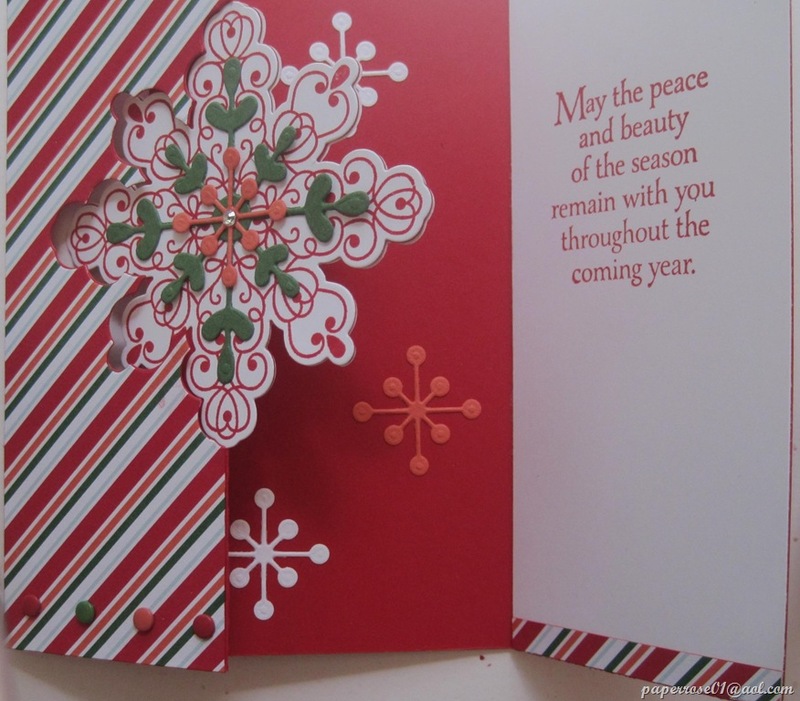 Iris Folding – two cards (one Christmas, one fall) on Friday October 17th from 3 – 5 PM and 7 – 9 PM; Saturday October 18th from 10 AM – 12 N and 1 – 3 PM. As I will need to demonstrate and give verbal instructions, I am giving specific times. Samples will be posted. Iris Folding is beautiful and so easy! You need two good eyes and patience! Stamp-A-Stack – 3 or 4 each of 5 different Christmas cards (total of 15 or 20 cards.) Thursday November 13th and Friday November 14th from 2 – 9 PM and Saturday November 15th from 9 AM to 4 PM. These cards will be totally different from cards done at Stamp Camp. We will be using different stamp sets. Samples will be posted. My computer son – Larry – is going to update the blog with links to the Holiday book and the 2014-2015 Annual Catalog. I can be computer challenged at times and he has to take over. Give me a call or send an E-mail if you have any questions or concerns about Stamp Camp, the upcoming special workshops, or need some interesting recipes!